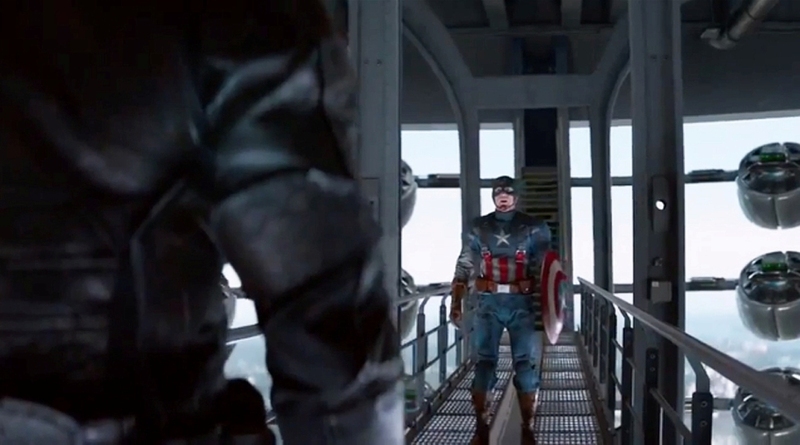 When we last saw Steve Rogers, aka Captain America (Chris Evans), the scientifically advanced super soldier had been frozen during the Second World War and defrosted in modern day, where he helped sort out the attack from Loki and the Chitauri in The Avengers. Now he’s dealing with a threat that’s much closer to home, when it appears SHIELD, the company he works for, may be a little more corrupt than he anticipated. The second part of my Clint-Eastwood-directing-himself-and-Morgan-Freeman-in-a-supporting-role double bill see Clint take on a genre he’s never really (that I know of) looked at before, the sports movie (please feel free to let me know if he has, I’m often wrong about these things and he’s been working for an awfully long time). If there’s two criticisms that can be lauded onto Eastwood, it’s that he doesn’t direct happy stories or portray more than one character. He’s not renowned for making lighter films with happy endings or playing people who aren’t grumpy, stoic curmudgeons with their trousers too high, and his streak continues here. I know he’s made a few lighter films (Paint Your Wagon, Every Which Way But Loose) but I haven’t seen them, and I’m guessing he plays the grumpy, stoic, possibly singing straightman to a comically messy primate who never stops annoying him. Again, please let me know if I’m wrong and recommend any films where he flashes a smile, once. 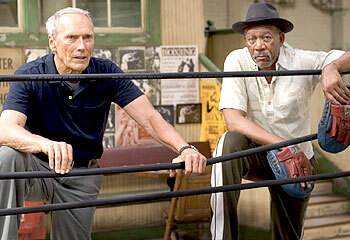 Here, Eastwood plays Frankie Dunn, a knowledgeable, best-there-is boxing trainer who can’t seem to get it together to be more than the owner of the run-down Hit Pit Gym. His latest fighter, Big Willie Little (Mike Colter) has a promising career ahead of him, with Frankie having gotten him almost to a title fight, but alas he leaves for a more prolific manager, leaving Frankie high and dry. Meanwhile, self-proclaimed white trash Maggie Fitzgerald (Hilary Swank) has joined his gym and is looking for a trainer, though Dunn is adamant that he doesn’t train girls. Her pluck and commitment eventually wears down Dunn, assisted by persistent advice from his assistant, Morgan Freeman’s retired boxer and former recipient of Dunn’s training, Eddie ‘Scrap-Iron’ Dupris. The story is a little corny and at times downright predictable. It’s clear that Maggie and Frankie will work together, each filling a void in the other’s life (Maggie’s father is dead, Frankie’s daughter has fled and refuses to acknowledge his efforts to contact her), and once they get going her rise through the ranks is unbelievable, especially as she never received any training until she was 31, but the delivery is spot-on. Heartstrings are at times shamelessly plucked, but justifiably so, and there’s a blindsided moment I genuinely didn’t see coming on first viewing. This isn’t your average rags-to-riches underdog sports movie, and it’s proud of this. There’s moments of humour, most noticeably from Dunn trying to talk to Maggie (“I’m going to try and forget the fact that you’re a girl”) and from Jay Baruchel’s simpleton wanna-be-but-never-gonna-be boxer ‘Danger’ Barch. Swank is, expectedly, brilliant, earning her second Oscar as she all but becomes the downtrodden heroine. Her family has never stopped putting her down (look out for Garfunkel & Oates’ Riki Lindhome as her welfare-cheating sister!) but she retains a dogged sense of determination, saving up all her money from waitressing jobs where she has to steal half-eaten steaks to survive, just to buy a speedball for training. The outcome of her trying to do something nice for the family that’s never done anything for her is genuinely heartbreaking. Eastwood is good, but it’s well trodden ground for him, and Morgan Freeman is wonderfully understated – until he gets a chance to show off some moves later on. There’s a lot to recommend about the film, but not a lot to bring you back. It’s certainly worth watching at least once, and I took a great deal away from it, but most of that was that I didn’t want to go through the harrowing gut-punch of an experience of watching it again any time soon.